Sometimes you just need to find product key information of installed software on your computer. For instance when you have, at some point in the past, legally purchased an official version of a software package and now is the time that you are going to re-install the software. You do have the original setup installation cdrom or dvd, but you can’t find the product key that you will need to re-install your software. You have searched your entire house, you have already looked at the help-about section of your software and you are starting to feel frustrated because you can’t find the product key? Don’t fret. You have an official, paid-for version of the software, and during the original installation procedure you have entered the product code somewhere, so if that code is in there somewhere, there surely must be a way to get it out as well, no? How To Find Product Key Information In Your Computer? The reasons why most software vendors have chosen to tuck away the product key somewhat deeper below the surface rather than in a more prominent place are food for discussion. Some say that it’s to avoid illegal copying and stealing of licensed product keys and others, but other theories exist as well. Whatever the reasons may be, there are a few super-easy tools available on the internet that you can use if you need to find windows product key information on your computer. Produkey on the nirsoft.net website is one of my favorites, because it’s so small (no impact on your existing operating system installation, so no performance loss), so simple to use and so efficient. Produkey will not only find Windows 7 product key info, it will also find Windows XP product key information and it will even find Windows 8 product key data, even though in Windows 8 the product key information is often times encrypted and embedded in the UEFI firmware. Simply download the tiny tool from the nirsoft website and then right-click the downloaded file and select “extract here”. 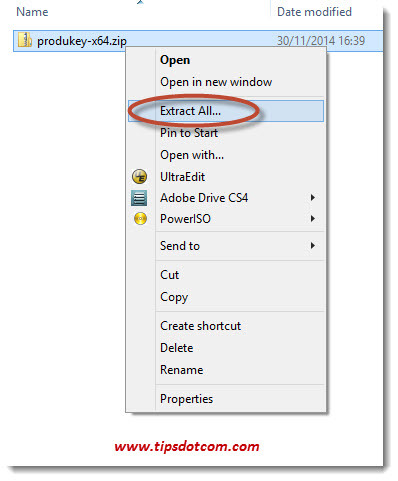 Make sure to keep the “Show extracted files when complete” checkbox and click the extract button. 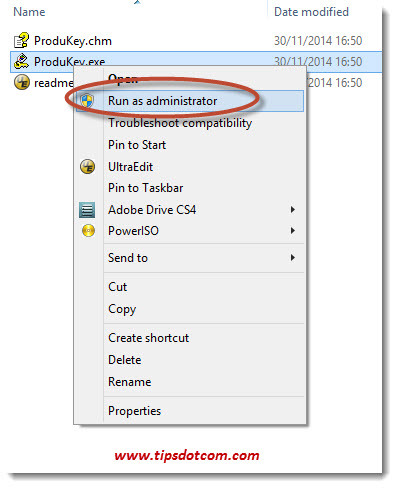 Then, in the new Explorer window that opens up after the extraction is completed, right-click “Run as administrator” to launch Produkey to find product key information about your currently installed operating system and Microsoft Office program. Produkey will immediately find Windows 7 product key information in your system, but it will also help you find Windows 8 product key data and Microsoft Office product keys. You don’t even have to install the product key finder utility to reveal the product key information from your software. I’ve always liked that as one of the strong points of nirsoft’s utilities and tools, because you don’t have to clutter up your system by installing extra software that will put extra luggage in the registry and potentially place an extra performance burden on your computer. Other Utilities To Find Windows Product Key Information? There are of course alternatives to find Windows product key information in your computer. Another well-known tool is Magical Jelly Bean Finder. This is a freeware utility that can also be downloaded free, but this particular utility does come with a light installation wizard. It doesn’t matter much which tool or utility you will use, as long as you pick one that doesn’t mess up your system with adware or spyware during installation, but I have used the abovementioned Produkey as well as Magical Jelly Bean Keyfinder on several occasions and they have both served me very well to find Windows product key information on many different computers. So whenever you need to find product keys to be able to re-install Windows on your computer, I can wholeheartedly recommend any of the two product key finders discussed here. I hope this article was helpful and has helped you on your way to a solution. Please take a brief moment and leave a comment below, I’d appreciate it, thanks!